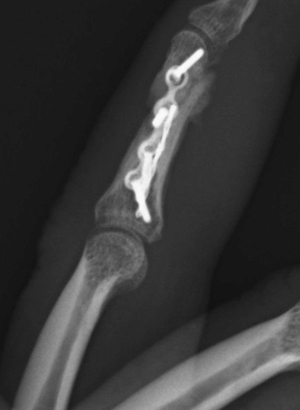 This 55 year old lady was bitten by a dog and presented with an open fracture of the thumb. 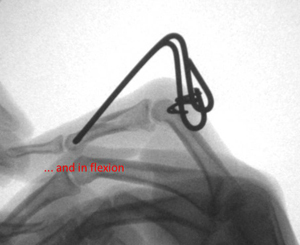 The fixation with a modern plate made from Titanium was stable enough to allow early mobilisation. 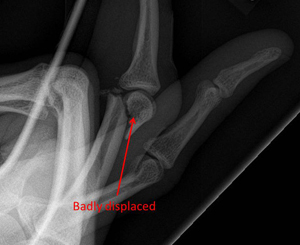 This young man broke his middle finger. 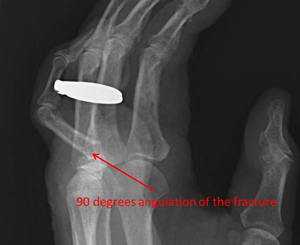 I initially tried to treat this fracture without surgery using a splint, but this didn’t work. 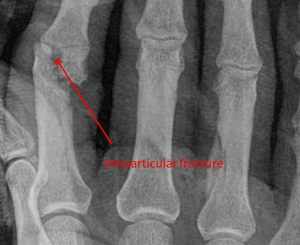 The fracture was then fixed using two mini-screws. 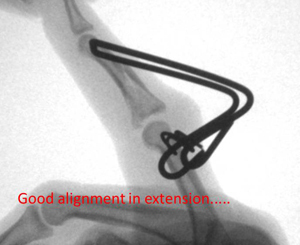 41 year old patient with sudden hyperextension injury.This resulted in an avulsion fracture of the insertion of the long flexor tendon of the middle finger. 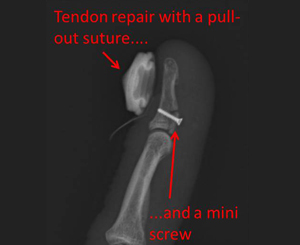 The tendon war repaired using 2 techniques: a traditional pull-out suture and an extra mini-screw. 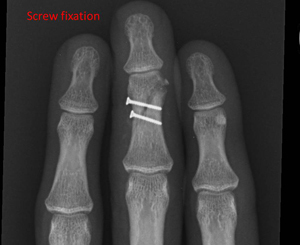 I fixed this unstable fracture of the index finger using a low-profile plate allowing early mobilisation. 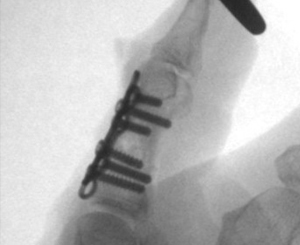 This 89 year old lady had such a badly angulated fracture that surgery was required. 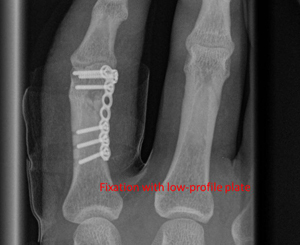 I fixed the fracture with a low-profile titanium plate. This was stable enough to allow early mobilisation. 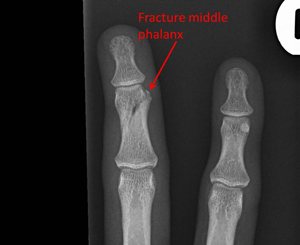 27 year old patient with an open fracture of the middle phalanx.The wound was debrided and the fracture fixed with a low-profile plate. The drill bits are so small and fragile that it’s not unusual for them to break. 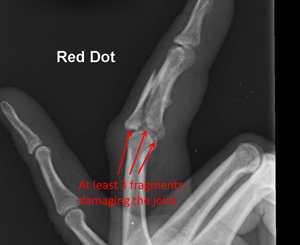 This patient's finger was shattered by a cricket ball. 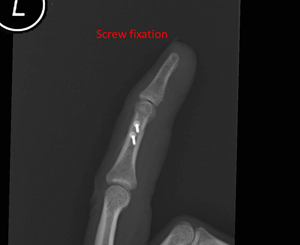 Due to the number and small size of the fragments a traditional screw fixation was not possible. 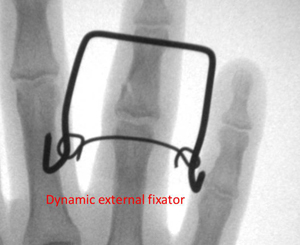 A so-called Dynamic External Fixator was applied. 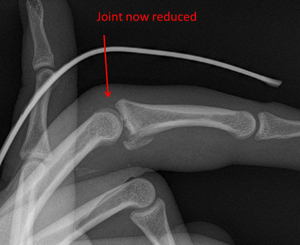 The device is spring-loaded and distracts both the joint and the broken fragments and helps to re-align everything. This is a very rehab-intensive treatment and it takes weeks of often painful exercises to get a good functional result. 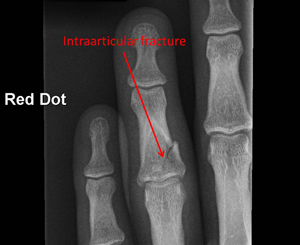 This intraarticular fracture has badly damaged parts of the PIP joint of the finger. 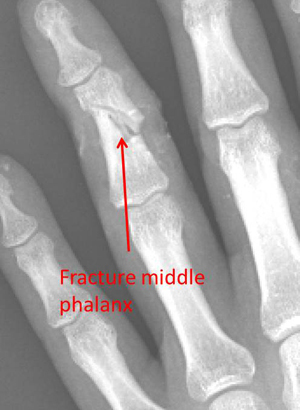 The fracture has also resulted in dorsal subluxation of the joint. 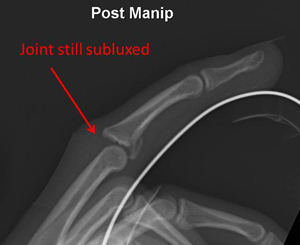 A splint was applied in the A&E department, but this didn’t correct the dorsal subluxation. 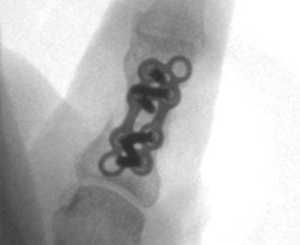 A so-called dorsal extension-block splint was applied with the finger bent. This reduced the joint and allowed flexion exercises straight away. 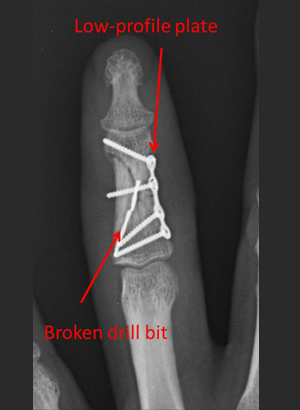 The splint needs to be straightened gradually over a period of about 3 weeks. 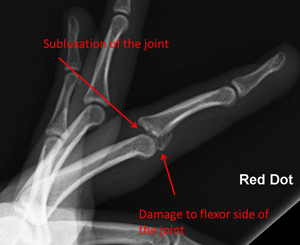 Although the joint isn’t perfectly aligned, the functional outcome is usually very good in fully compliant patients who are happy to work hard with the hand therapists. 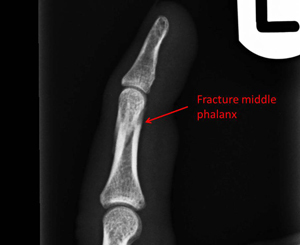 25 year-old male with displaced fracture through the neck of the proximal phalanx of the ring finger. Fixation with a low profile plate.